One of the great things about Apple’s Mac computers is that not only do they stand the test of time and continue to be performant over the years, but they also hold their value extremely well. That means that if you are a current iMac or MacBook owner, and want to move up to the new and improved model, then you can generally recoup a decent amount of money for your older hardware. There’s always someone out there looking for a bargain Mac via secondary sales channels. 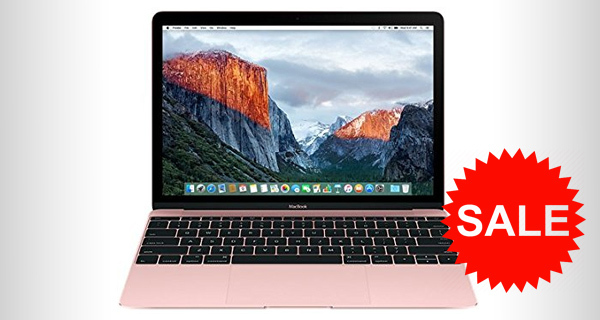 And speaking of bargains, if you do want to upgrade your hardware, Amazon is offering a limited time $100 discount on Apple’s latest and recently released 2016 12-inch Retina MacBook. Apple’s latest notebook offering isn’t a MacBook Pro. Nor is it one of the company’s budget MacBook Air models. It simply goes by the name of “MacBook”, and has the stunning premium aesthetics with internal performance to match the mysterious name. Those opting to go through with this deal will get the latest 2016 model MacBook with an internal 256GB PCIe-based onboard flash storage. The lightweight little machine has a 12-inch Retina IPS LED-backlit display, offering up a 2034-by-1440 pixel resolution for stunning clarity. There’s also an internal Intel HD Graphics 515 chipset. Processor wise, this particular model comes equipped with a 1.1GHz dual-core Intel Core M3 chip (Skylake family), which offers Turbo Boost up to 2.2GHz. There’s also an accompanying 8GB of 1866MHz LPDDR3 RAM to give the machine the processing capabilities that the user deserves. The machine ships with OS X El Capitan and has the very definition of a stripped down port setup, offering only a single USB-C port that handles both power and accessory connectivity. It is worth noting that this limited time healthy discount is only offered on one specific model. Those wanting to benefit from the $100 deduction will have to settle for the entry-level 256GB option, finished in the new Rose Gold color. As always, act now before it’s gone.